Greene King Double Hop Monster India Pale Ale is a popular Ale available from DrinkSupermarket.com in 330ml to buy online. Visit DrinkSupermarket.com for the best price for 330ml of Greene King Double Hop Monster India Pale Ale or compare prices on our other Ale products. Greene King brew their diverse range of craft beers in the art-deco surrounds of the St Edmund's Brewhouse in Bury St Edmunds, Suffolk, using over 25 varieties of hops including Cascade, Fuggles, East Kent Goldings, Galaxy and Williamette. The Brewhouse is named after the 9th Century Saxon ruler King Edmund of East Anglia, who, according to legend, the Vikings tortured and killed when he refused to renounce Christianity.Gold Medal winner at the 2014 Monde Selection Quality Awards. Where to buy Greene King Double Hop Monster India Pale Ale ? Greene King Double Hop Monster India Pale Ale Supermarkets & Stockists. 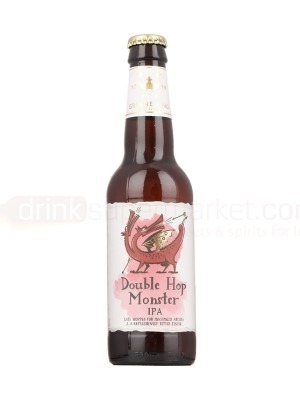 You can buy Greene King Double Hop Monster India Pale Ale online in most retailers and find it in the Ale aisle in supermarkets but we found the best deals online for Greene King Double Hop Monster India Pale Ale in DrinkSupermarket.com, and others. Compare the current price of Greene King Double Hop Monster India Pale Ale in 330ml size in the table of offers below. Simply click on the button to order Greene King Double Hop Monster India Pale Ale online now.